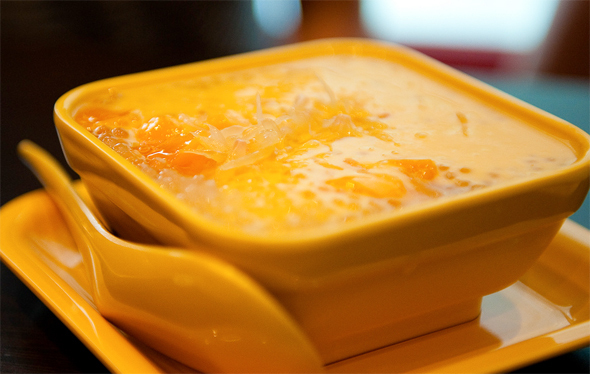 Nobody is entirely sure where the dessert goodness of the Mango Sago originated from. Hong Kong is probably as good a guess as any, with the famed Hui Lao Shan dessert shop sprouting in the island-state at a rate reminiscent to that of Starbucks in the USA. This dessert is now a personal favorite of mine whenever visiting Singapore, where a host of traditional dessert stall has upped the ante, producing local creative mixtures combining various old-school ingredients. My own preferences however, still lies with the original – a flavorful mixture of sweet mangoes, hearty sago and refreshing pomelo. Mango Sago goodness. Photo credit – Eugene.Pictured above is the personal favorite I proudly proclaimed earlier on, Mango Sago with Pomelo. First timers would do well to try the original favorite before testing out other more creative creations, such as a combination of Mango Sago with Green Tea Ice Cream, or Mango Sago with Grass Jelly, amongst others. These tasty desserts make for a refreshing and much needed after lunch boost, to prep you up for the next half of the work-day ahead! Another popular stall. During weekends, they would sell out by 6pm, a good 2 hours before closing time. Come early or risk missing out. This stall is a popular with the office workers around the area, and are usually crowded out by 8pm, right after dinner time. A hidden jewel that has been discovered by working adults and teenagers alike. This post is part of WanderFood Wednesday, a Blog Carnival held by Wanderlust & Lipstick. Check them out for a visual treat of tasty dishes, or take part in the carnival yourself! About the Author. Nikolas Tjhin. A graphic and web designer in its previous incarnation, Nik’s journeyman career has seen him do work for various creative studios in Wisconsin, Minneapolis, Singapore and Jakarta. Now, he’s settled down for the time being and focusing his efforts as the editor of an Asia travel zine, Unearthing Asia.